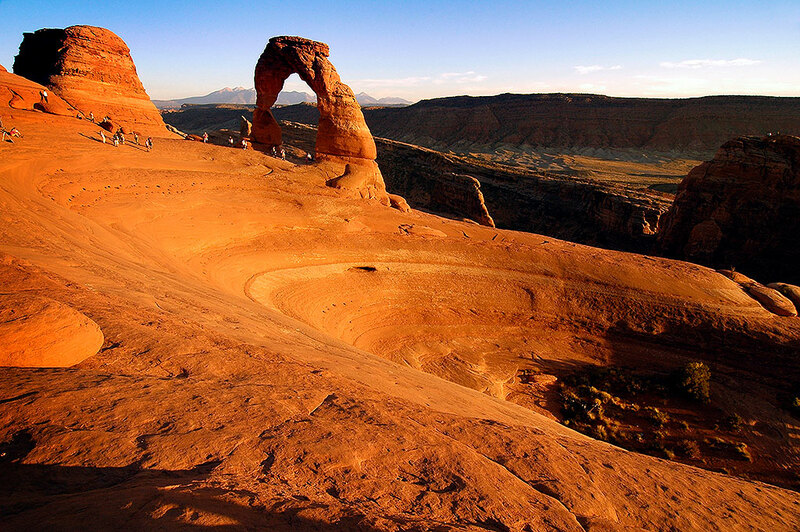 Delicate Arch, where our marriage began a year earlier, shines in evening light. 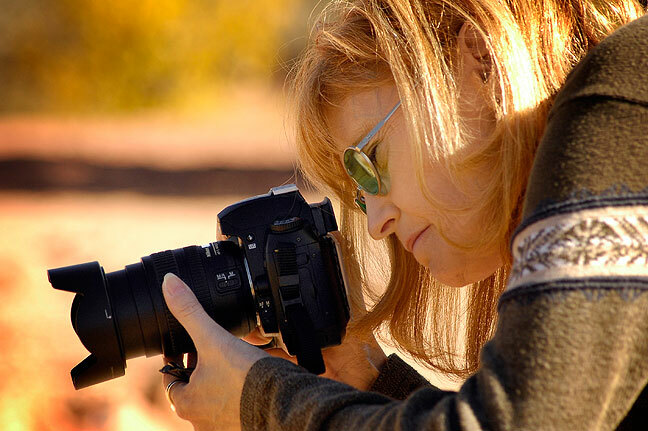 Abby photographs Square Tower House at Mesa Verde National Park at last light. 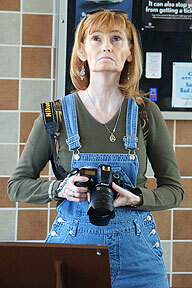 Abby photographs “our” Texas rest stop. 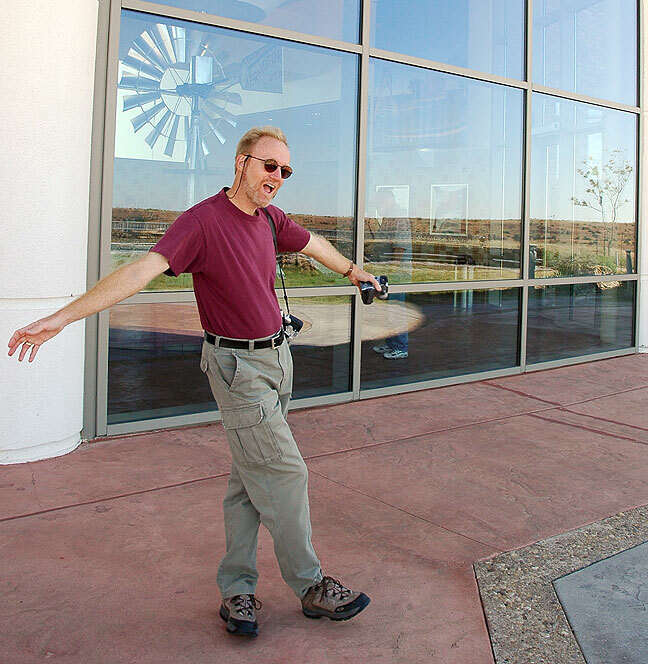 We drove from Ada, Oklahoma to Santa Fe, New Mexico, making a stop at our favorite rest area in the Texas panhandle, which we visited on our first vacation together, The High Road, in 2003. We usually refer to it as “our” rest area. We had fun playing around on the grounds and making a few pictures. 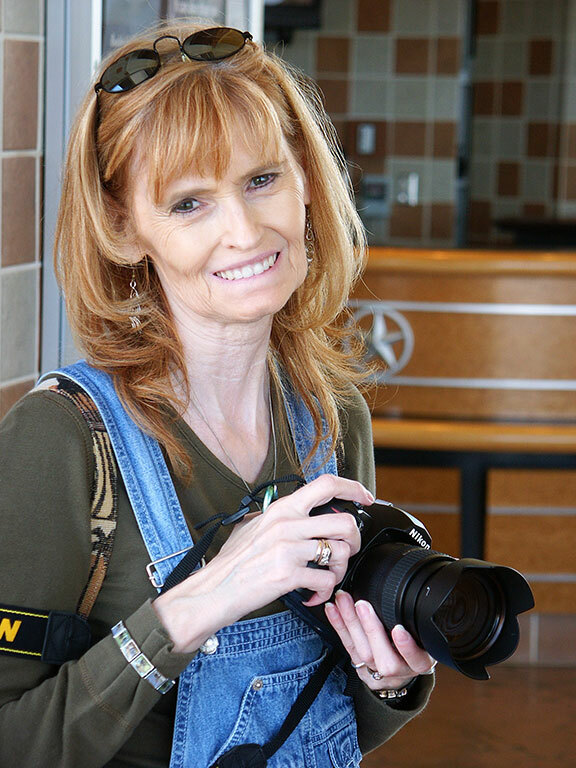 Abby holds her camera and smiles as she photographs the windmill on display at “our” Texas rest stop. 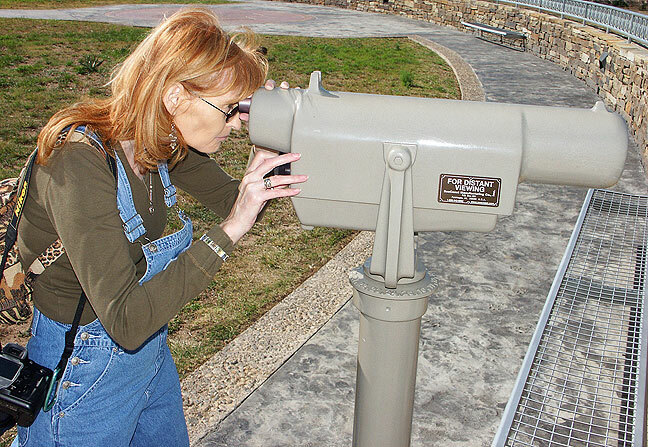 Abby looks through a telescope at the rest stop in the Texas panhandle. 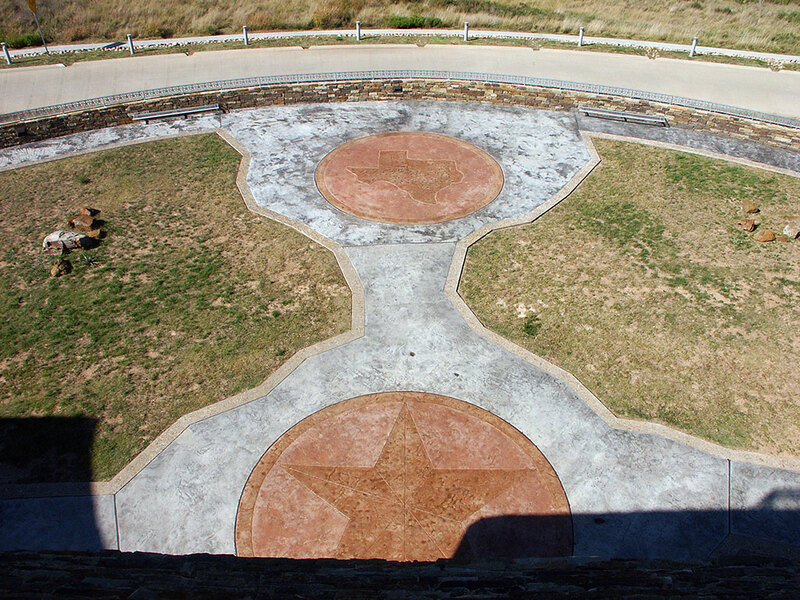 Abby poses in the “Lone Star” at our favorite rest stop in the Texas panhandle. 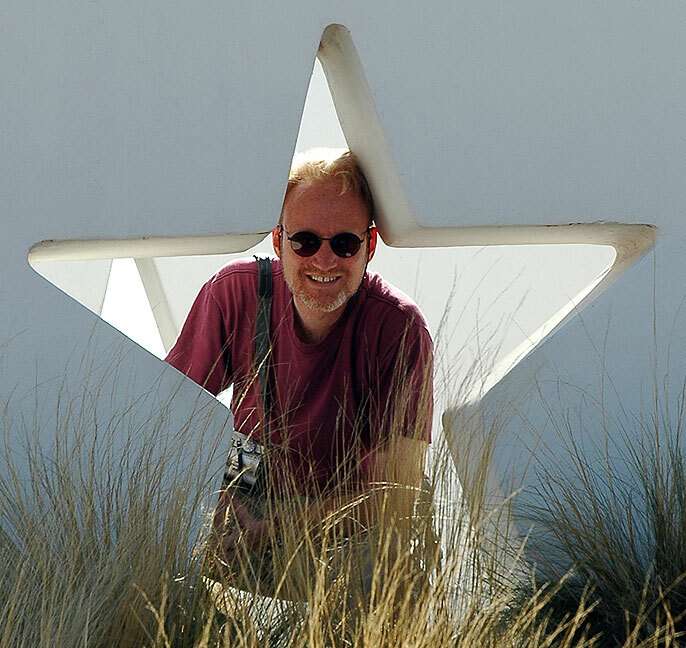 Richard poses in the same “Lone Star” at the Texas rest stop. Abby and I pose together at “our”Texas rest stop. The author horses around at our favorite Texas panhandle rest area. Staying in Santa Fe, we discovered that the Chinese place we liked so much the last on our first vacation together and our wedding trip, Ten Ten, had become a truck salvage yard. We had Chinese food delivered by a place called “Little House” instead, and it was delicious. 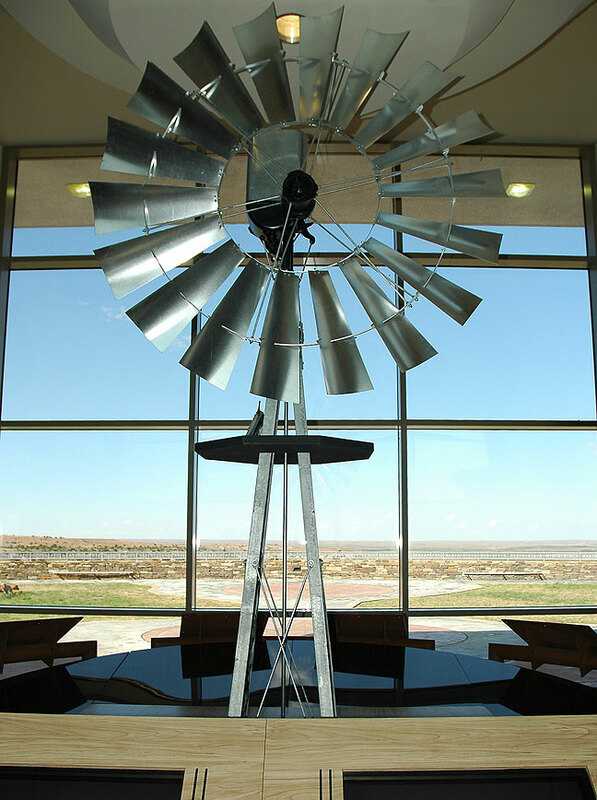 Abby photographed this windmill in the lobby at “our” Texas rest stop. 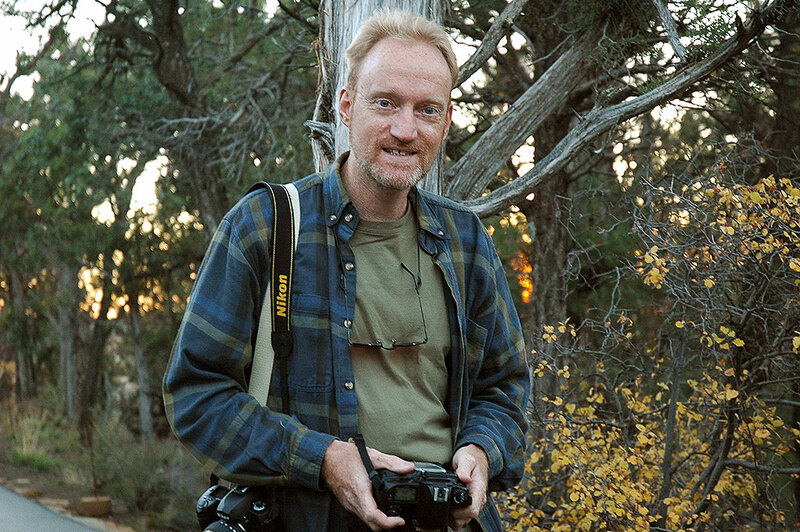 The author photographs cottonwoods in afternoon light near Chromo, Colorado. 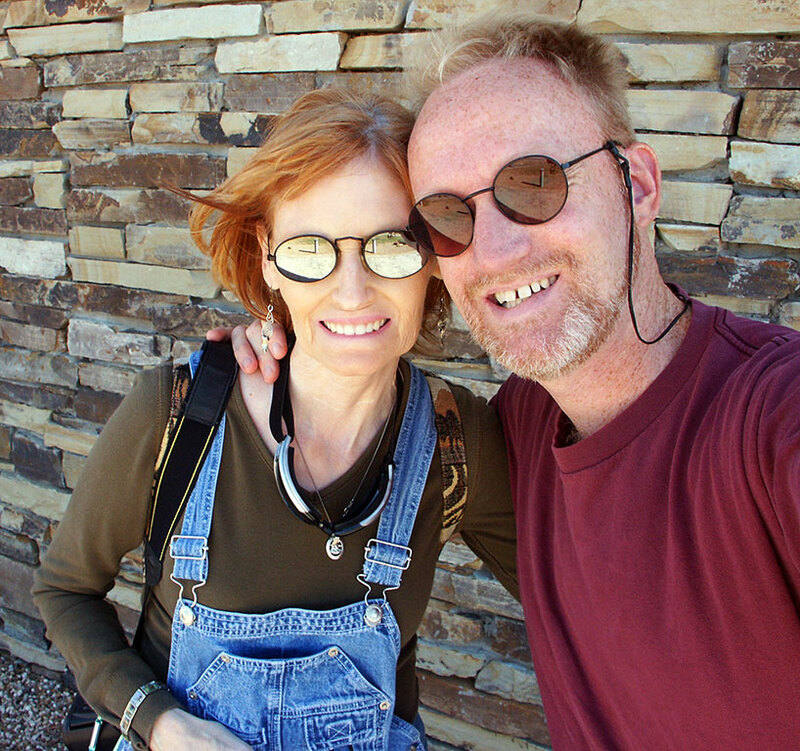 We drove the Chama Valley and into Colorado, not shooting much, but instead just enjoying being together. 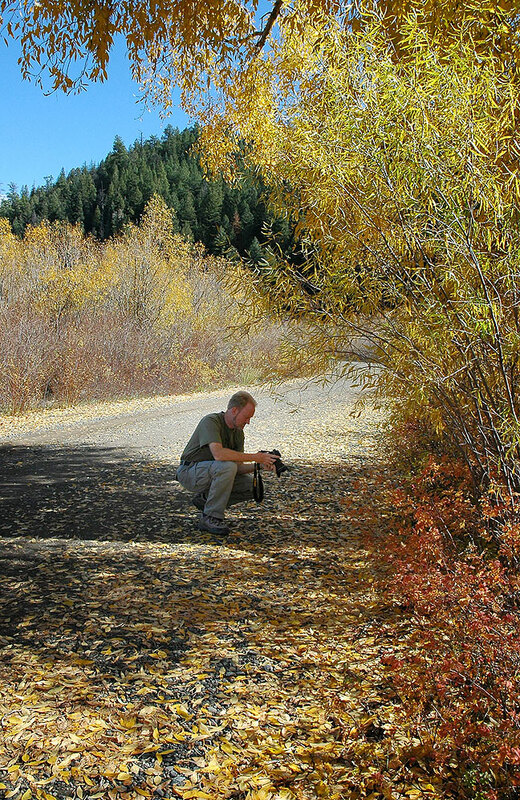 We did, however, stop to shoot some nicely golden trees by the roadside in a valley. 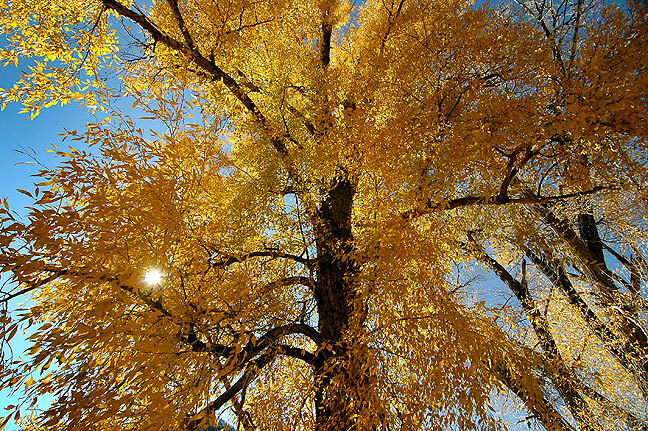 Afternoon sun streams through cottonwoods on U. S. 64 in southern Colorado; the light and air were exceptional. 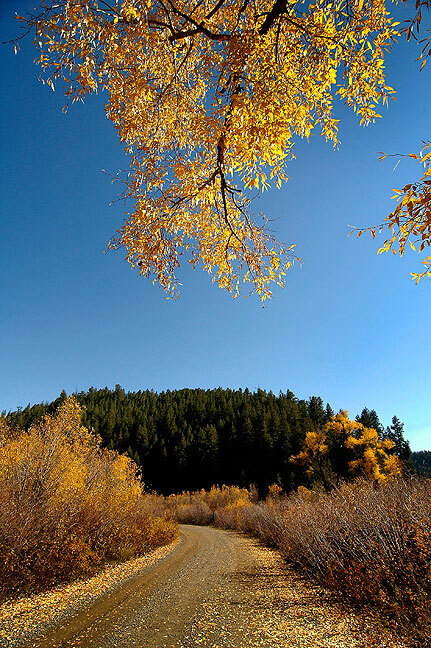 Cottonwoods hang over an unpaved road off of U. S. 64 in southern Colorado. 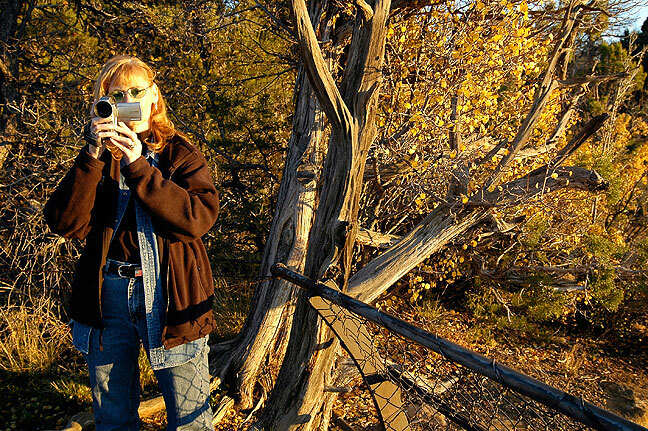 Abby photographs Cottonwoods near Chromo, Colorado. 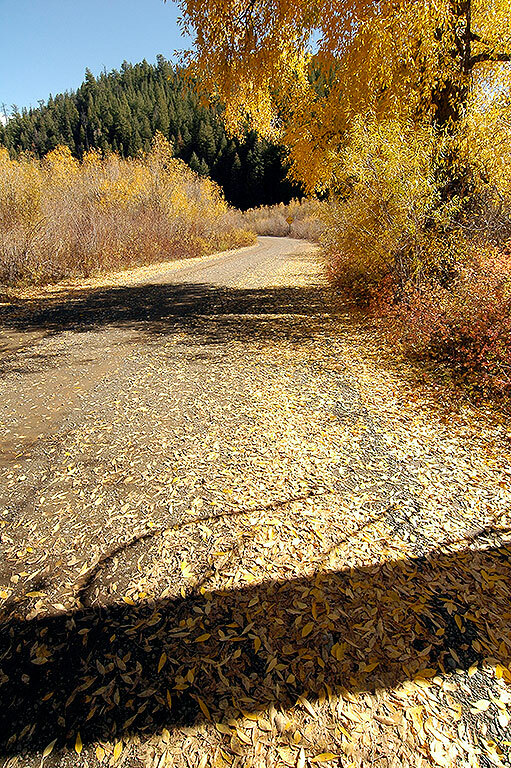 Leaves scatter across the road on a turnout near Chromo, Colorado. 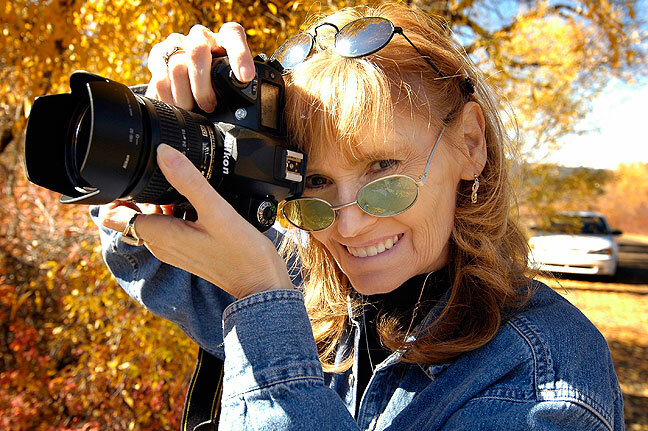 Abby flashes me her smile as she makes pictures at a turnout near Chromo, Colorado. 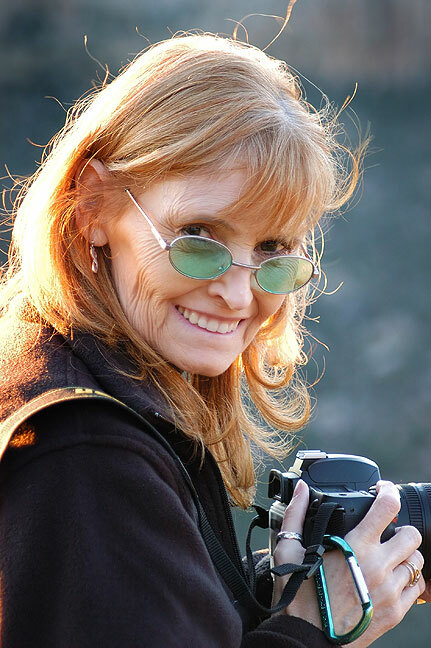 Abby makes video at Square Tower House, Mesa Verde National Park, Colorado. 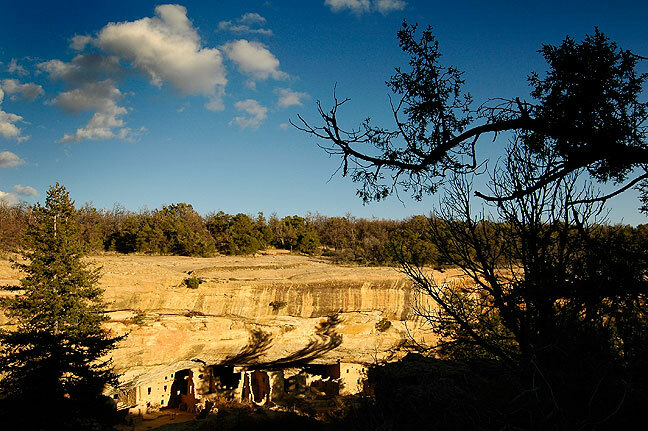 By late afternoon, we were fortunate to be at Mesa Verde National Park in time for sunset at Square Tower House. 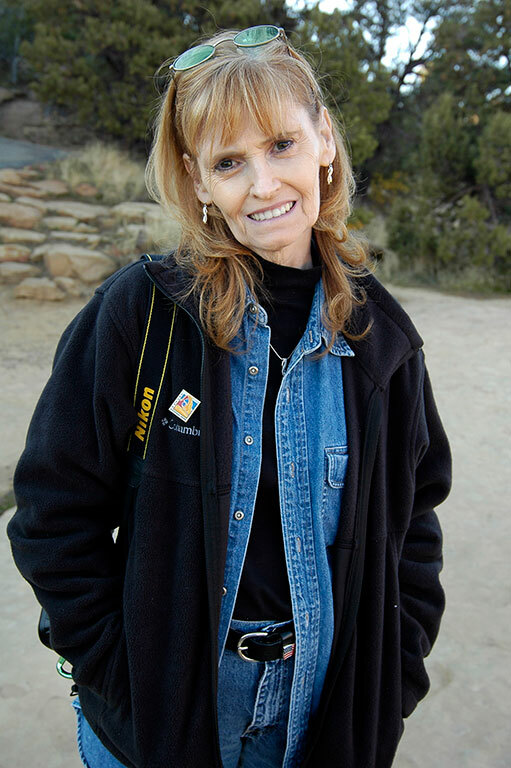 Abby smiles as we walk to the Mesa Verde National Park visitor center. 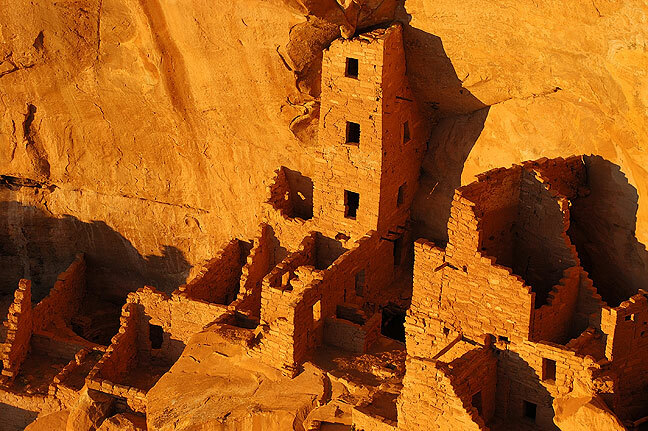 Spruce Tree House at Mesa Verde picks up late afternoon light. 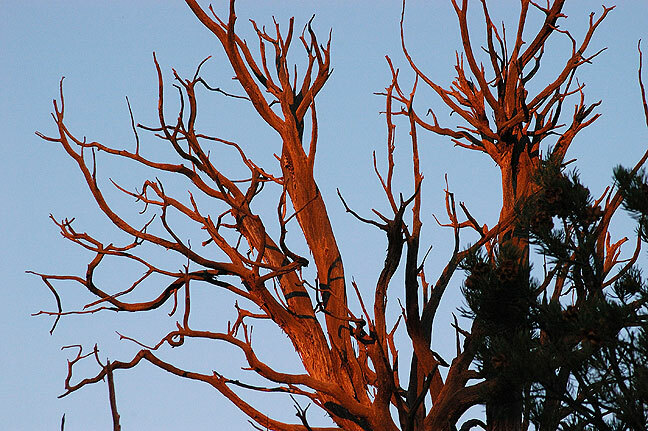 A tree stump takes on sunset light at Square Tower House. 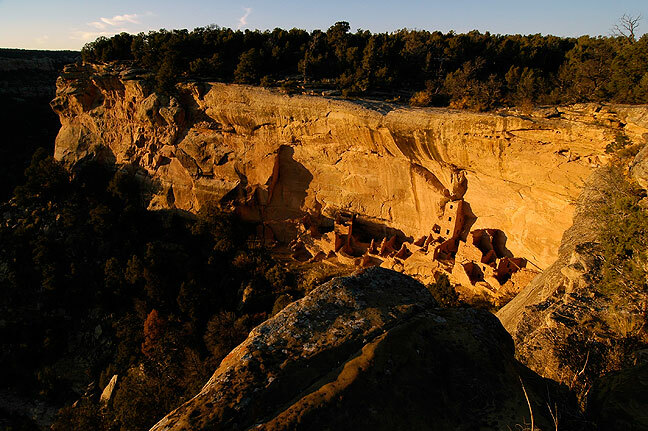 This overview shows the scene from the Square Tower House overlook at Mesa Verde National Park, at sunset. 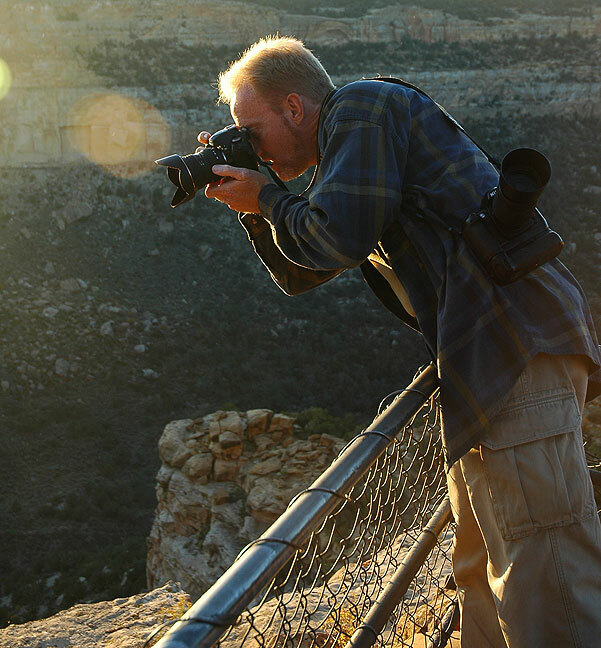 The author makes pictures at Mesa Verde’s Square Tower House. 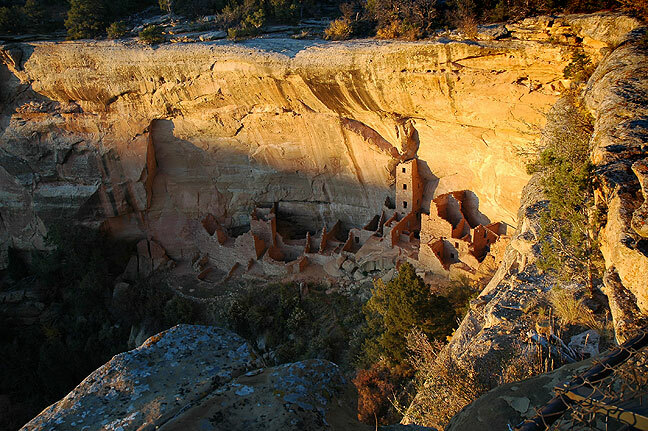 Last light falls on the Square Tower House cliff dwelling. 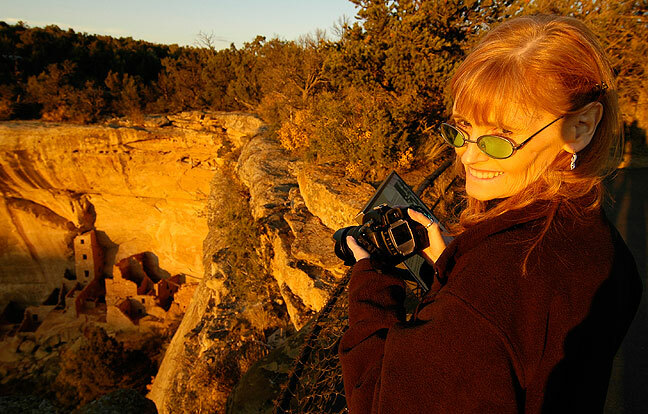 Abby smiles as she makes pictures at sunset at Mesa Verde; this is one of my favorite images of her. This is the image Abby made just before looking up and smiling at me in the previous image. After the golden moment had passed at Square Tower House, and we were walking back to the car, we spotted these red streaks of sunlight on the tops of trees. 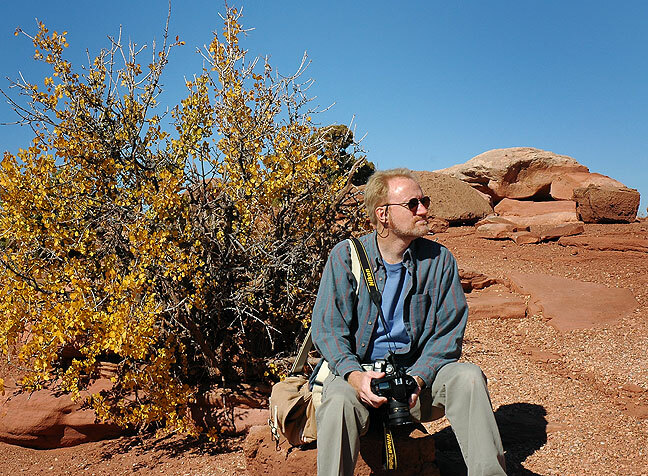 Abby made this image of me as we walked back to the car after visiting Mesa Verde’s Square Tower House overlook. 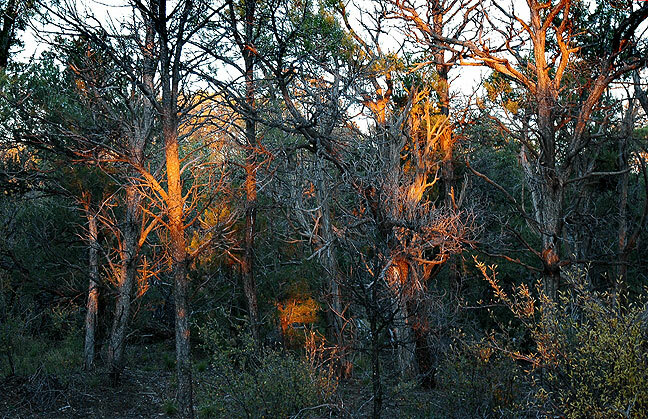 Also on the walk back to the car after seeing Mesa Verde’s Square Tower House overlook, Abby made this haunting image of last rays of sun at the edge of the trail. 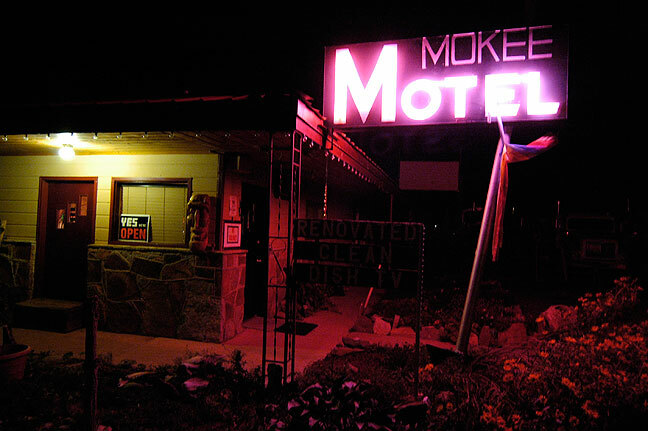 The Mokee Motel is in the small southeastern Utah town called Bluff. 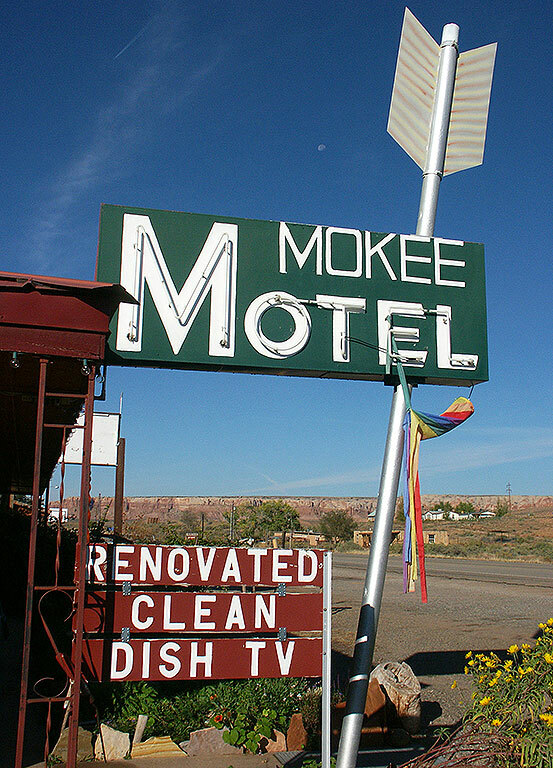 Abby and I found the Mokee Motel in Bluff, Utah, clean and charming. 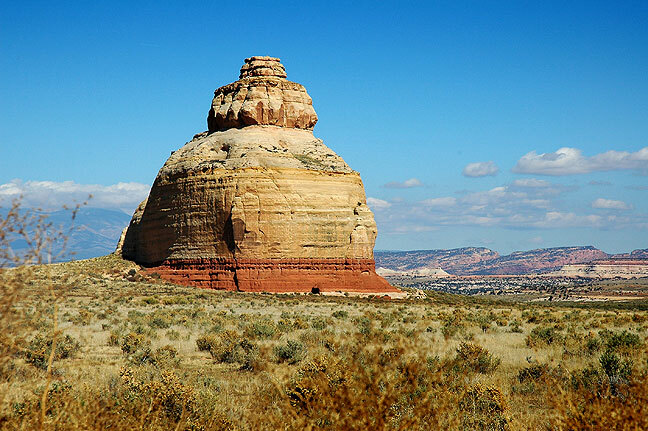 Abby shot this handsome image of Church Rock on U.S. 191 on the drive to Moab, Utah. 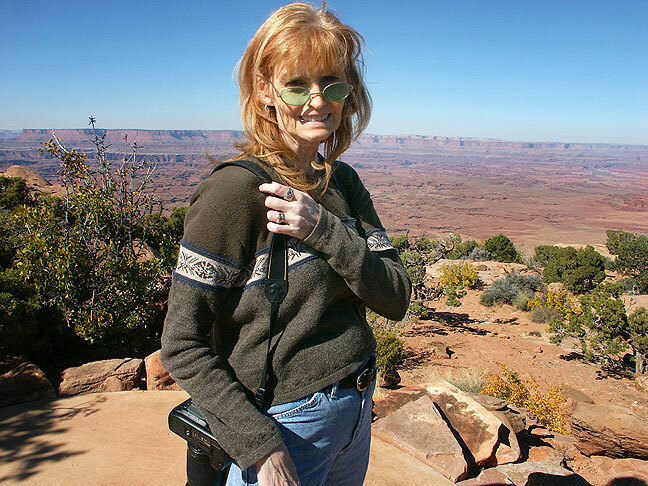 We made our way up to the Moab, Utah, area. We had a very nice drive through Arches National Park, where we got married last year, but Abby wasn’t feeling well enough to hike, so she insisted that I hike up to Delicate Arch anyway to shoot it at sunset. Despite Abby’s absence, and a sea of tourists, it was a worthwhile endeavor. 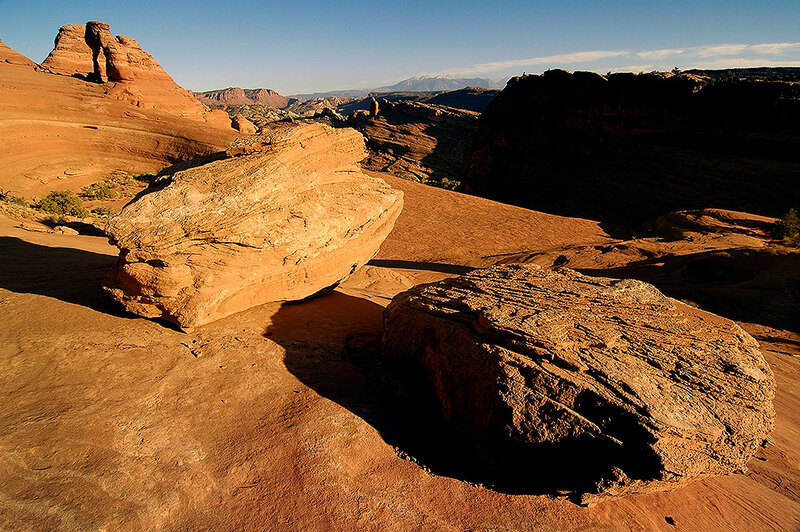 I made this image from a ridge just south of Delicate Arch. 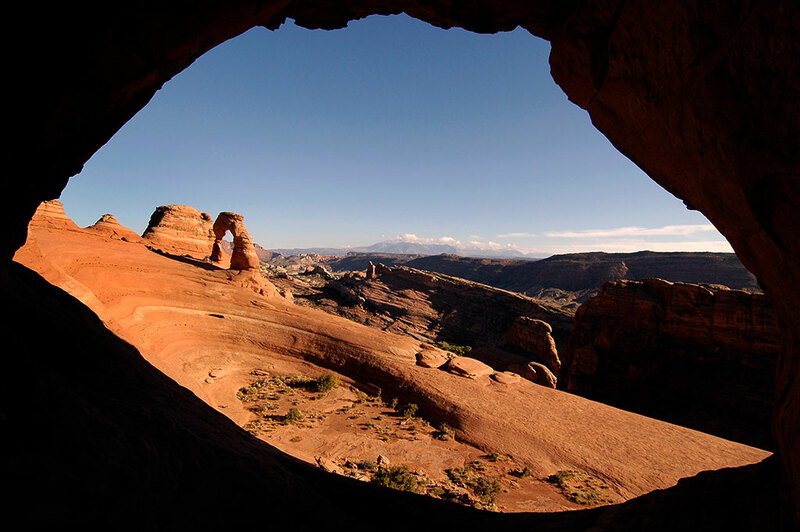 On the approach to Delicate Arch is Frame Arch, though which is this view of the entire Delicate Arch vista. 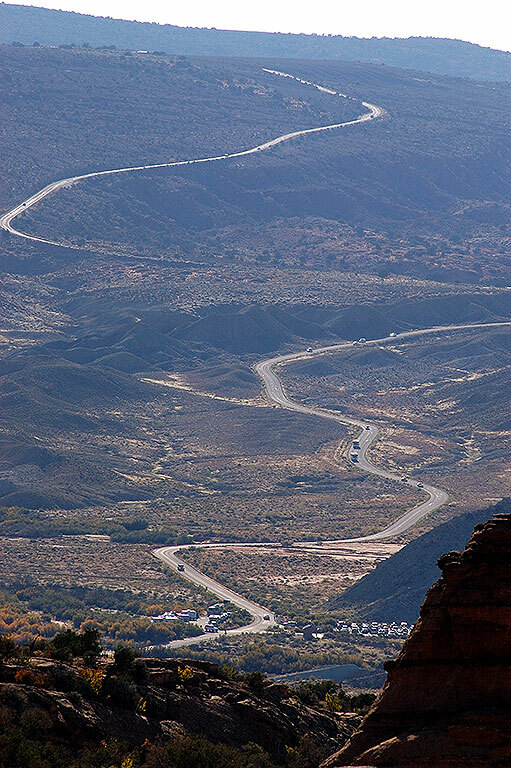 This view looks west from Delicate Arch at the road leading to the trail head. 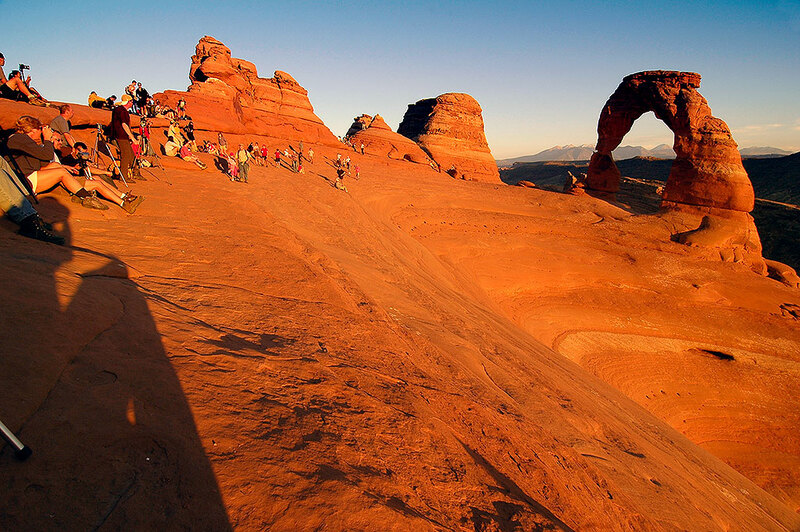 Visitors crowd the Delicate Arch area as sunset approaches. 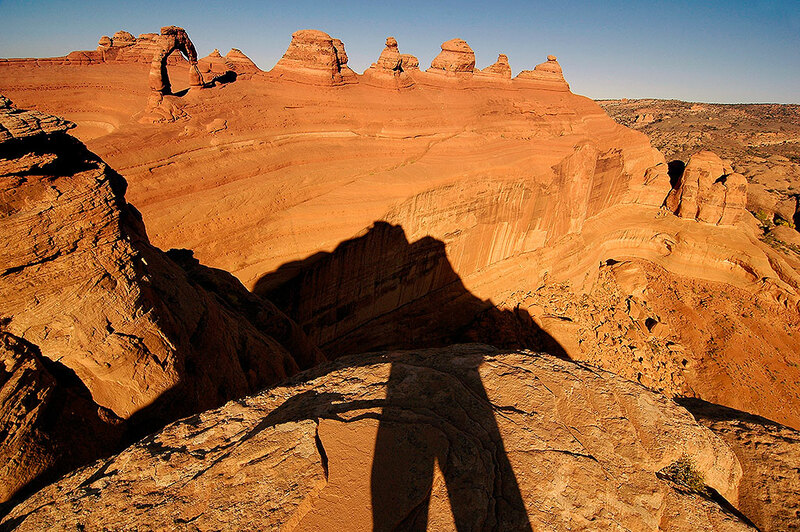 Stones cast shadows north of Delicate Arch, which is visible in the upper left corner. 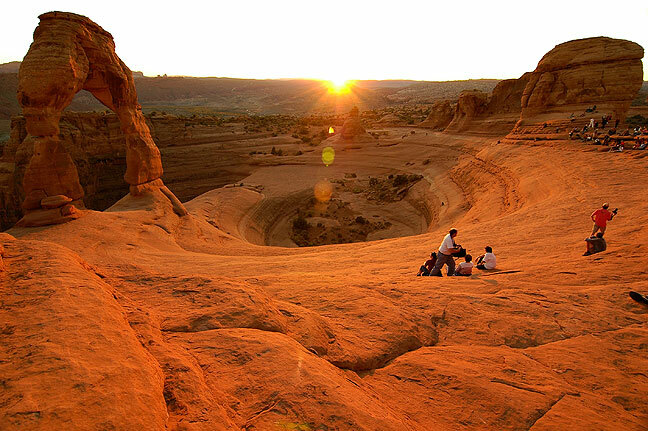 The sun touches the horizon at Delicate Arch. 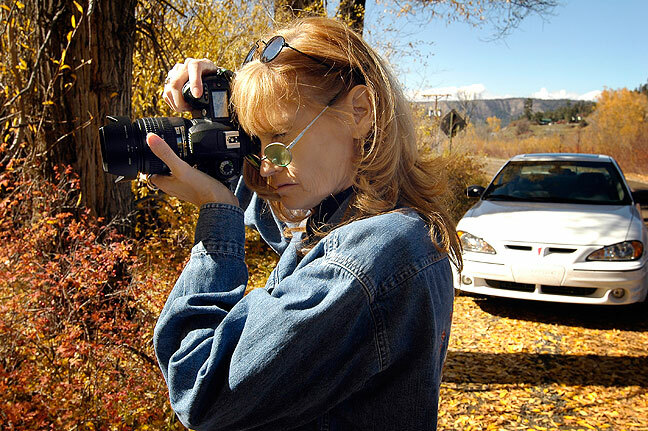 Abby bends to get just the right angle on an image at the Needles Overlook at Hatch Point. We enjoyed a very romantic breakfast, then headed south, stopping at Hatch Point to see the Needles Overlook. It was a beautiful day. I think Abby and I were both surprised and delighted by what we experienced looking out over the vastness of this place, one of my favorite in the world. 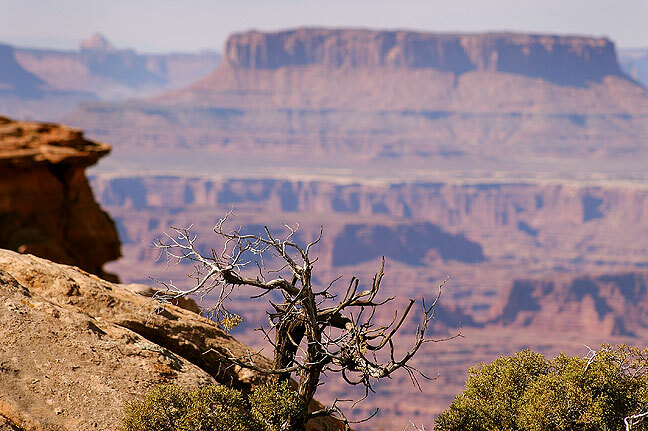 It was an excellent way to introduce Abby to Canyonlands. Abby smiles as we make the short walk around the Needles Overlook on Hatch Point. 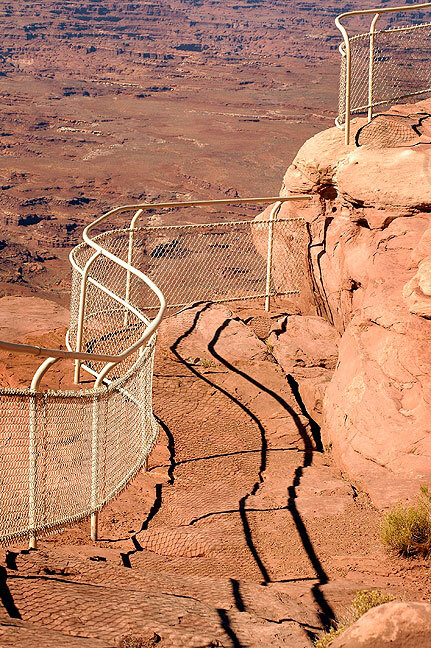 Fences line the trail at the Needles Overlook at Hatch Point. 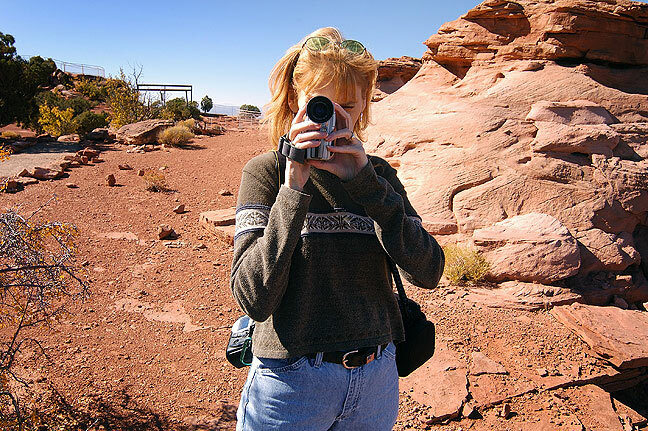 Abby makes video of me at the Needles Overlook at Hatch Point. 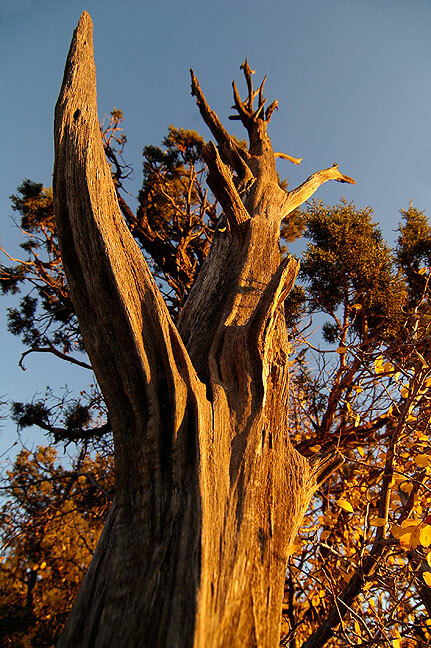 A weathered dead tree stands against a perfect blue sky at the Needles Overlook. 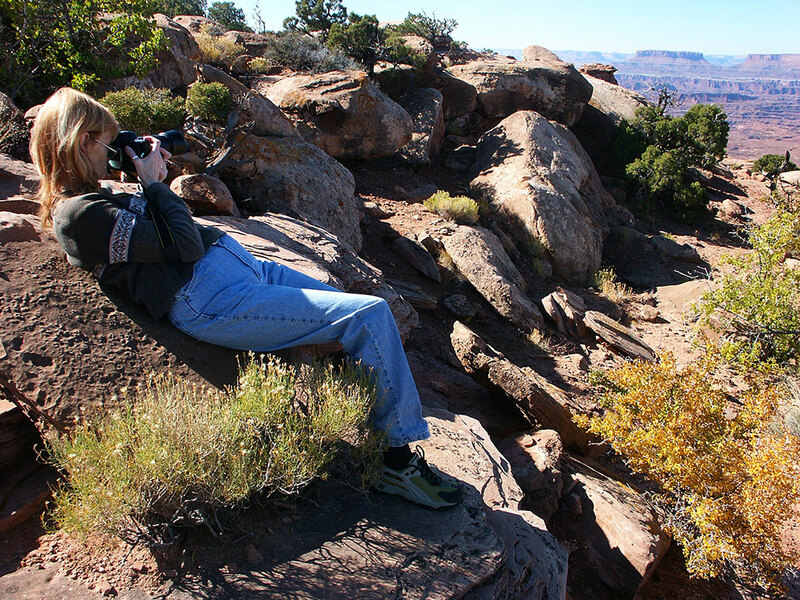 Abby lies on a rock to get an image at the Needles Overlook. Your host poses for Abby’s camera at the Needles Overlook. 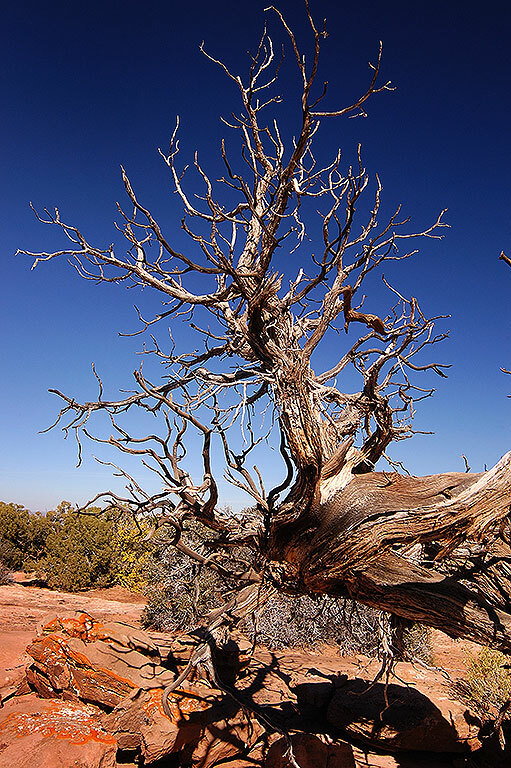 Junction Butte is visible in the background of this view of a dead tree at the Needles Overlook. It was an exceptionally romantic first anniversary trip. There is simply nowhere I would rather be than with her, on the road or on the trail, or just by her side. 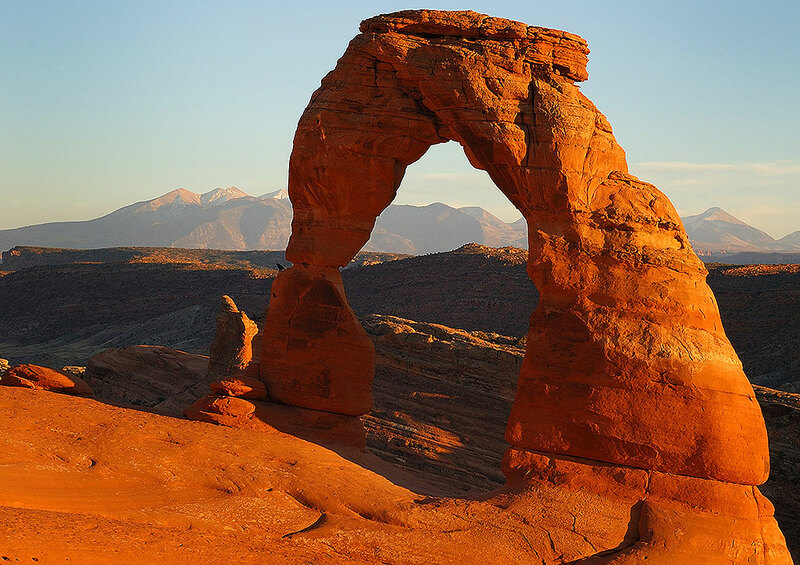 This iconic shot of Delicate Arch was made just a few moments before sunset.